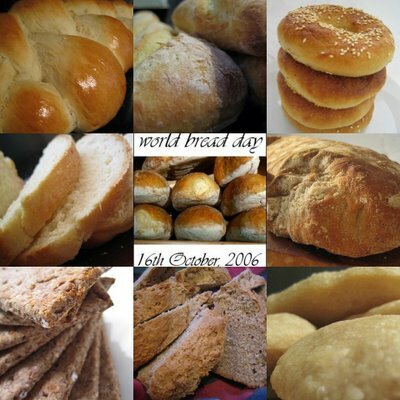 Monday 16th October 2006 is World Bread Day, organised as a blog event by Kochtopf. Now, I love making bread, strangely enough possibly more than eating it, so it was hard to choose what sort of bread to choose for this event. So I didn't choose. I just decided to show a few different types of bread that I, and G, make, and to give a basic recipe for the most simple of breads. The picture above shows clockwise from top left : challah, pain à l'ancienne, bagels, ciabatta, pita, buckwheat soda bread, crispbread and soft white. Some of these breads have recipes on this site already and some are on the way! And there are many more breads that are not pictured - naan, English muffins, crumpets, lavash, and sourdough. Mix the yeast and salt into the flour. Add enough water to hydrate all the flour, you might need more or less. Knead for about 10 minutes to form a smooth and elastic dough, adding more flour or water as necessary. Put in an oiled bowl and cover with plastic wrap and leave in a warm place for about two hours or until doubled in size. Punch down (literally) and form into a loaf shape, you can use a tin or go free form. Cover with plastic and leave to rise again in a warm place for about 30 minutes while you preheat the oven to 220°C. Slash the top of the loaf to prevent bubbles under the crust and bake for about half an hour or until the loaf sounds hollow when rapped on the bottom. Leave to cool for at least 30 minutes to complete the cooking before slicing. And the best thing to have with bread? Butter of course! It is a great event isn't it! Hooray for bread! Yes indeed, butter is the best thing on bread. And the second best thing on Italian or French bread is a really good fruity olive oil. What's not to love about a warm piece of bread dressed only with a little butter? Mmmm I had homemade bread and butter for lunch today. Think we'll be having it for tea too, although I might fire up the barbeque and makes some salad to go with it also. Have a great long weekend Em! The crispbread looks delectible... great inspiration! Thanks! Bron - I have been hanging out for the first BBQ of the season, but sadly the weather hasn't been agreeing with me.